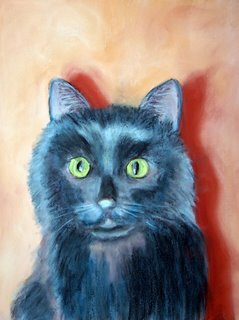 Snickers was the first pet portrait I tried. He came out a little misproportioned, and ended up looking more like a cartoon cat or a stuffed animal! LOL, it did suit his personality since there does seem to be a bit of the cartoon cat in him indeed. He is such a funny little character. But I decided that I would try him again today and see if I could make him look a little more like a real cat and not a toy, and this is the result.